Lila has recently moved to a new city and she is really looking forward to start school to meet new friends. But things don't go as she expected. The very first day the bully of her class teases her saying her hair and eyes are black as a crow. Lila starts using a hat, dark glasses, and even a high neck sweater to cover her body as much as possible. This don't stop the bullying, and Lila is terribly sad. One afternoon running home from school Lila trips and falls. A crow comes near her. She can then observe how beautiful its black feather are, so black they seems to have kind of a purple gloss. Lila also sees how soft and bright its eyes are. She follows the crow to where hundreds of crows are. The sight is magnificent. When they fly away thousands of black feathers "rain" from the trees. Lila stuffs her backpack with them. At home she uses them to make a crow costume for the Great Autumn Festival at school. When she enters her classroom in her beautiful, black dress, all the kids run to her, to admire her costume and touch the soft feathers. Lila feels happy to be a crow. Gorgeous illustrations accompany this sweet story. Lila, like any other kid, is avid to fit, to be accepted by her peers. She had never thought there was something wrong with the color of her hair or eyes. What others say makes her feel ashamed of it, but hiding who she is doesn't make things better. She makes the journey of finding back her own beauty, and this makes her feel strong and confident again. Lila is beautiful, and she knows it. 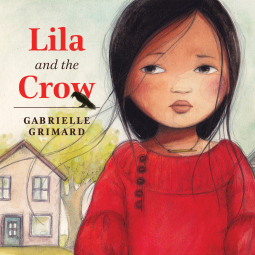 Gabrielle Grimard has illustrated many other picture books, but as far as I know this is the first time she authors the text too. Very promising. I'm interested in take a look to her future works. And another great read from Annick Press.